A few years ago knitnscribble wrote about Rowan’s free knitting pattern ‘online only’ offerings for teen pullover sweaters by Sarah Hatton. Since then, the links have been removed by Rowan, because their KidSilk yarn has been discontinued. Still looking for the unisex sweater jumper pattern called ‘Bria’? …a good answer for everyday casual wear for ‘tweens, depending on the yarn used, can be appropriate for girls or boys. A reader from New Zealand brought the dead links to my attention and with a few emails was able to get the sweater pattern from Rowan. Kindly sent and now posted here. Please download it and print it out for future use. Knit with US 8 (5 mm) and 10 (6 mm) needles, it should be easily finished in no time and also a good beginner sweater pattern. 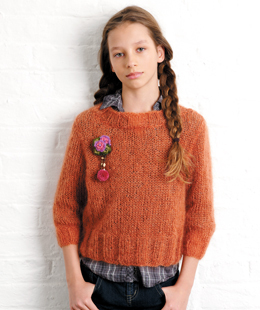 Sized to fit ages 10 to 16: S, M, and L.
Bria sweater pattern by Sarah Hatton from Rowan.